The new 3A H3ADLINE has addressed the burning question on our RC posters. 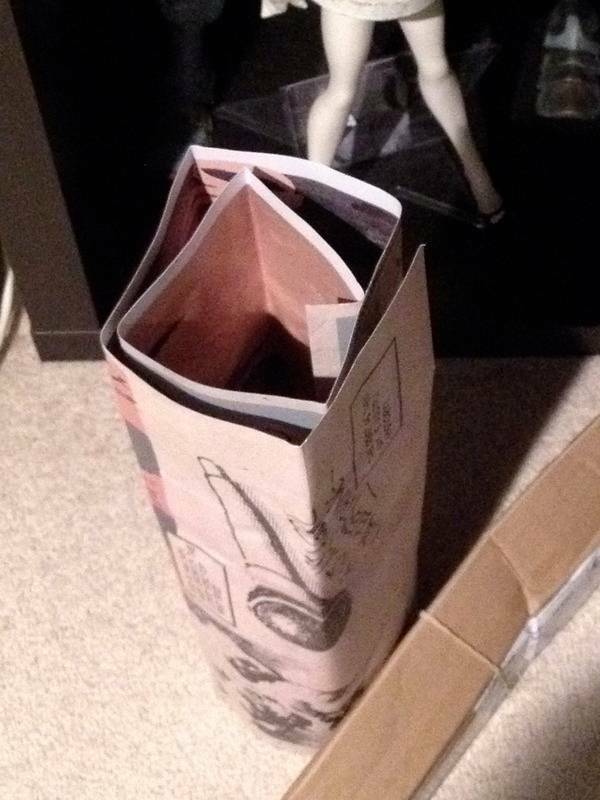 Ashley Wood wrote: Oh yea, Girl R/C posters are shipping separately as the boxes were too small, you will have them soon! Rolled in a tube you reckon? Girl R/C is so sweet, I reckon she edges out Mezco's Batman! Crushed in a tube. What was the reason again? Tracking has it to be delivered tomorrow or Friday. I will post up when it comes. Tube about as long as my arm, hence it was never going to fit in the Girl R/C box to begin with without some serious folding. Poster is double-sided and the paper feel like it has a plastic coating. I actually like having the poster shipped rolled up this way. I would actually prefer it done in the future like this. I wouldnt mind a bit more of a charge for it since the old style of folding up the posters to fit in a box made for some unfortunate crease lines (for framing). I would have kept her in my collection if she wasn't child-size. 10" body & headsculpt are a huge fail scale-wise imo. bubblegumking wrote: I would have kept her in my collection if she wasn't child-size. Spot on! I was so happy to be able to sell mine once I was bummed out on seeing how off the proportions were!. Honestly I think it was another screw up, but not enough people ordered her and were motivated to point it out. the poster looks pretty nice, I wonder if they really forgot or if they were trying to see if they could get away with it. I dont think it was so much "get away with it" but more they just spaced on the fine text about the poster. Prob. focused more on making new boxes for the 10 inch body type. Whatever, didn't buy her for the poster. In fact every single poster is still in the box. Girl RC is my fav RC! A little bummed, but whatevs. That is rough, mine was only creased on one side. bonus doesn't mean they should be treated like trash. they are an integral part of the 3A experience. the posters cost money to produce: paper, ink, time, logistics. they cost time and money to ship separately. why, then, not do it right? The way they handle these posters, is bad management of their own resources, and a lack of respect towards customers. Just received mine.. box smashed in and poster completely ruined. Fitting that one of the final 2 items I receive from threeA perfectly exemplifies their lack of care and respect for their customers, customer experience and products. I really can't get away from them quickly enough.. It's a pity thay 3A is pushing people away, but i guess for every one that quits, there are dozens more than join in, or else 3A wouldn't be growing so much / so quickly. Ash keeps on saying that 3A is a small operation, and i guess compared to Hasbro, etc, they are... but really can't they hire ONE more person to help supervise things like adequate packaging, number of grenades included is correct, etc. I'm still in 3A because they keep making cool figures and (so far) i haven't had serious QC problems, though i feel for those who do and i know that it may only be a matter of time until i receive a bad figure. For what it's worth, CS and 3A Staff are still kind and helpful... but that doesn't solve the fact that almost every release that people have paid money up front to receive, is plagued with some kind of QC problem. Just got my free RC Poster. I didn't think the sets were getting the poster since it doesn't say in the Bamba description, but I guess we are. Not that I'm going to use it, but it's just nice to have. Hey that's the blue one on the poster. pezbanana wrote: It's a pity thay 3A is pushing people away, but i guess for every one that quits, there are dozens more than join in, or else 3A wouldn't be growing so much / so quickly. From what i've seen, i like the artwork very much.